Taib (right) visits a gallery which showcased the transformation of Score over the last 10 years together with Abang Johari (second left), Uggah (left) and Awang Tengah (third left) prior to the start of the dinner. 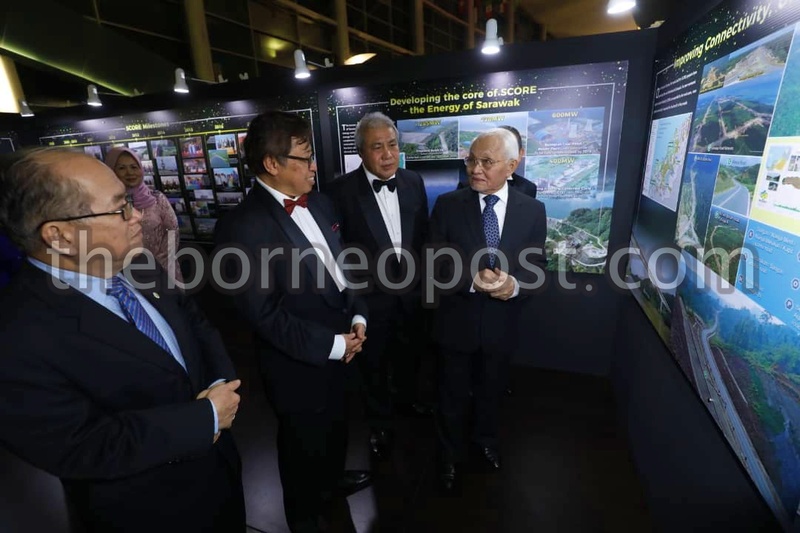 KUCHING: To expand the Sarawak Corridor of Renewable Energy (Score) area into the interior and rural parts of the state, the Sarawak Government has established three development agencies under the Regional Corridor Development Authority (Recoda). The agencies are namely; the Upper Rajang Development Agency (Urda) and the Highland Development Agency (HDA) that were both established on July 12, 2017 and the Northern Region Development Agency (NRDA) that was established on March 15, 2018. “This is in tandem with the state development agenda to accelerate the development of physical infrastructure and amenities in these areas in order to modernise the rural economy,” said Chief Minister Datuk Patinggi Abang Johari Tun Openg at the Score 10th Anniversary Celebration dinner that was held at the Borneo Convention Centre Kuching (BCCK) last night. With the latest initiative, the Score area he said has now been expanded from about 70,000 square kilo meters to about 100,000 square kilo meters or two thirds the size of Sarawak. Also present at the celebration was the Yang di-Pertua Negeri Tun Pehin Sri Abdul Taib Mahmud who was given tributes for his outstanding contributions to Score when he was the chief minister of Sarawak. Abang Johari also revealed that through the Score Development Plan, the state is forecasted to generate RM334 billion in terms of investments of which RM267 billion or 80 per cent is expected from the private sector while the remaining RM67 billion will come from the public sector. When the Score Development Plan is fully realised by the year 2030, it is also expected to create 1.6 million new job opportunities especially for young Sarawakians. Since the inception of Score in 2008, Sarawak has recorded an average economic growth of 3.2 per cent. The State nominal Gross Domestic Product (GDP) in 2008 he said was RM86.9 billion and is forecasted at RM145.2 billion in 2018. “Our Nominal GDP per capita in 2008 stood at RM36,075 and is RM51,925 in 2018. Score has contributed significantly to the economic performance of the state, especially through its public and private investments,” said Abang Johari who is also chairman to Score. With the establishment of the Development Bank of Sarawak (DBoS), the state government he added is now able to provide funding of RM4.5 billion to Recoda for the development projects under Urda, HDA and NRDA. On that note, the state government he said will continue to support the development of Score as it is proven to be an effective effort towards and industrialised state. To date, Score he said has recorded over RM79.971 billion of both public and private investments. “Out of this, RM33.64 billion or 42 per cent comes from private investment. The total amount of private investment realised thus far is RM22.53 billion, generated from nine projects that are already in operation,” he added. Seven of these projects he added are in Samalaju Industrial Park while one each are located in Mukah and Tanjung Manis. Abang Johari also revealed that seven of the investors in Samalaju Industrial Park have contributed significantly to the local economy by generating a spillover of about RM500 million per month. Also present at the dinner were Deputy Chief Ministers Datuk Amar Douglas Uggah Embas, Datuk Amar Awang Tengah Ali Hasan, Minister for International Trade and E-Commerce Dato Sri Wong Soon Koh, Sarawak Biodiversity Council chairman Datuk Amar Wilson Baya Dandot, State Secretary Tan Sri Morshidi Abdul Ghani and Recoda chief executive officer Datu Ismawi Ismuni.